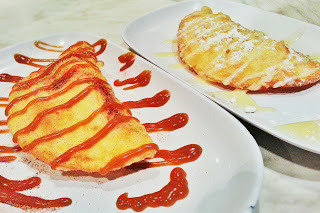 From last night's dinner: BonChon's latest dessert offerings, crispy crepes in apple caramel and mangoes and cream. 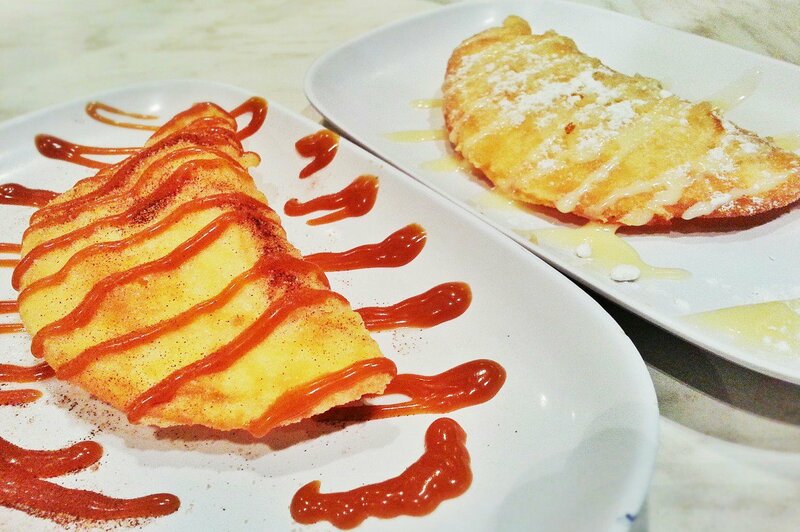 If you prefer Krispy Kreme over J.Co when it comes to donuts, you'll probably like BonChon's crispy crepes too. They're affordable at P60 each. Not gonna elaborate anymore, but my work friends and I, although we really usually dine at the BonChon in Eastwood City, regret deciding to have a late supper there last night. Desserts came first, after an hour of waiting, although we had asked the cashier lady to serve them later. I personally love their soy garlic chicken and fish recipes but I think I'm gonna lay off BonChon for a while.